Skalicky’s Sweet Sensations Bakery and Candyland opened in December of last year in Newberry Square, which is located on Main Street in downtown Lewiston. The bakery serves a vast array of delicious treats to satisfy the sweet tooth. Skalicky’s also has a good amount of gluten-free alternatives that are just as yummy. 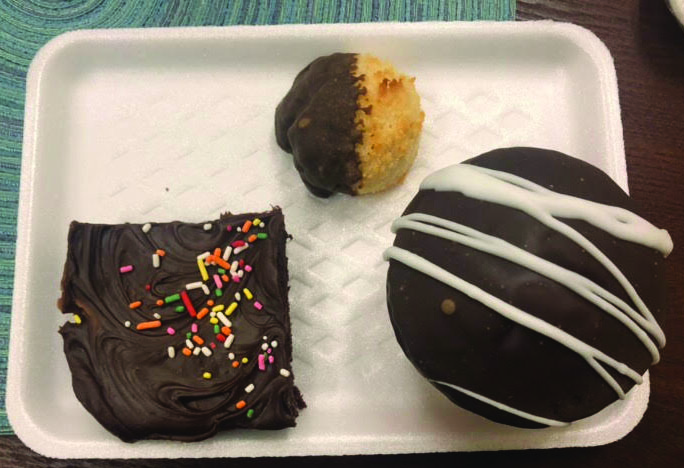 The items that will be discussed in this review are the Bavarian Cream-filled vanilla cupcakes, the Fudgy Brownie, the chocolate-dipped macaroon and the hot chocolate. When one first enters Skalicky’s, they might get a feeling of nostalgia. This is due to the fact that one half of Skalicky’s is actually a toy and candy store. It seems like a smaller, bakery-type Cracker Barrel environment. This makes a unique atmosphere for this business, because it makes visitors feel sort of like a little kid — which might bring out the sweet tooth. This visit started off on a very high note with the gluten-free Bavarian Cream-filled vanilla cupcakes. These are pretty much heaven on Earth. The texture is amazing. In the first couple of bites, this seems like a very well-made vanilla cupcake, but then this gets a million times better with the cream filling. It adds just another amazing flavor to this amazing treat. The fudgy brownie is pretty good, but lacks the flavorful flare of the cupcake. It is not necessarily bad, but it does not seem as unique, or well-thought out as some of the other items on the menu. It seems home-made, but not exactly in a good way. Nevertheless, it is still above average. The conclusion of this sugar-filled feast consisted of yet another high-note in the form of the chocolate-dipped macaroons. These treats provide a sensational and chocolatey flavor and a surprising texture. One does not find dessert items on this level at any typical food place. Each of these particular macaroons will make the mouth watering for yet another one, and perhaps even another one after that. They are truly addicting. When it comes to places in dedicated to satisfying the sweet tooth, they are very few — if any — local places like Skalicky’s Sweet Sensations Bakery and Candyland. They do an amazing job of providing filling, scrumptious goods that will surely satisfy a sweet tooth. This — along with the unique toy and candy section — proves that Skalicky’s is one of the best places around for a sweet snack. For these reasons, Skalicky’s Sweet Sensations Bakery and Candyland gets a 4/5.